Take a look around the room you are in…how bad do you want to update something…ANYTHING in the room? What is holding you back from taking the leap and doing a few of those home improvement ideas? Cost, time, lack of discipline and confidence? Check, check, and check. Trust me, we’ve all been there a time or two. (or maybe even more!) 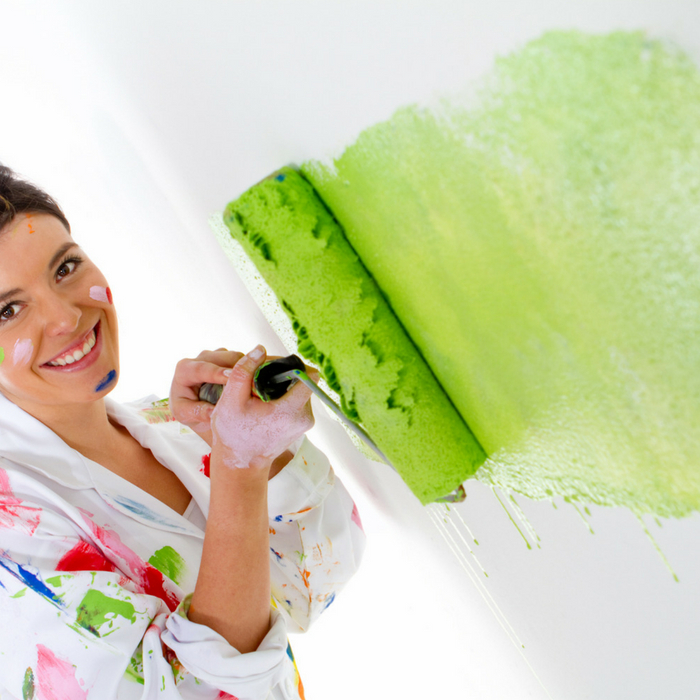 Rest assured that there are super simple ways that you can update your home without breaking the bank! All you need is a bit of confidence, time and patience and you’ll be done remodeling sections of your home before you even know it! If you want even more DIY inspiration, check out these DIY ideas that anyone can do! Don’t break your bank buying, make stuff and do tasks yourself and save. Paint the walls. Simple as that. Head to the store, pick out a paint color and paint those walls. And if you truly don’t care about the color of the wall, pick out one that is in the clearance section. You can get gallons of paint for under $10 quite often when discounted! Paint your countertop. Did you know that you can actually paint your countertop instead of replacing it? For under $100, you can have a brand new looking countertop without the hassle, the cost or the dust! Change out the handles on your cabinets. Don’t have time or money to replace your cabinets? No worries, just give them new handles and call it good! Install new ceiling fans. It’s amazing how new ceiling fans can truly change the overall appearance of the room! Make your choice be a good flow with the rest of your rooms as well. Lay down new laminate flooring. Depending on how picky you are on the pattern, you can get some new kitchen/bathroom flooring really cheap. Throw away the old window blinds and upgrade! The moment that you toss those old plastic blinds, you’ll feel better instantly! There are so many other options to upgrade your window coverings that are a ton better. Restain your hardwood floors. Rather than replace them, give them a facelift! It’s a lot cheaper to restain and refinish than to replace everything! Change out your faucets. One of the first things that people notice in the bathroom and kitchen are the faucets. If yours are a bit outdated, why not change them out? It’s a simple home remodel that anyone can truly do. Paint your kitchen cabinets. One of the biggest eyesores that people complain about are the cabinets in their kitchen. Replacing them all is a huge cost, but painting over them to make them look new again is absolutely possible. Replace the shutters on the front of your house. Tired of how the curb appeal for your home looks? Why not change out your shutters and replace them with a different color and style? It’s simple, and there are a ton of different varieties and options to choose from! Light coverings. Do your current light coverings look a bit yellow? Change ’em out to something a bit more modern! Add a rolling barn door to one of your rooms. Have a small room that doesn’t have much space? Get rid of the traditional door and add a rolling barn door instead. The kits can be bought at most hardware stores and are super simple to do. Buy new rugs and lay them over the stained carpet. Can’t afford to lay new carpet but definitely need a fresher look? Rugs will do the trick each and every time! Paint your front door. A fresh pop of color on your front door will change the whole appearance of your house! Change the outlet and light fixtures covers. It may not seem like it makes a difference, but it absolutely does! You’ll be amazed at how something so little brightens up the room. These 15 home improvements are so simple that anyone can do them! Why not give your home some upgrades and save a bit of money while doing it?